I grew up on baseball. From watching games, to collecting cards, to little league, to high school ball, and then back to just watching games, baseball has been a common fixture in my life since I was six years old. In 1986, when I was 12, I had my first major formative baseball moment in the form of the 1986 World Series. Living in Los Angeles at the time, I had just endured a brutal American League Championship Series with Boston’s Dave Henderson homering off Donnie Moore to eliminate our beloved California Angels and advance the Red Sox to the World Series. The homer was such a powerful event that it not only crushed the Angels but it also led to the eventually suicide of the pitcher who threw the pitch. Furious at the Red Sox for beating the Angels, I adopted their World Series opponent, the New York Mets, as my favorite team of the moment. I watched the entire Series thinking Boston was going to win. They played a great Series and had the Mets down to their final out in the 10th inning of Game 6. And then I was introduced to the Curse. The Mets Mookie Wilson hits a routine ground ball to first base which inexplicably trickles through first baseman Bill Buckner’s legs into right field and Ray Knight scores, giving the Mets the victory and leading to a decisive win in Game 7 to seal Boston’s fate. I was overjoyed at the victory but had no idea of its significance in New England baseball lore. You see, there was this pretty good Red Sox baseball player in the early 20th century named Babe Ruth. He pitched. He hit. He was the Bambino… bigger than life. And then for some reason, in 1920, the Red Sox decided to trade him to the Yankees for $125,000 cash. Yes, even then, the Yankees were buying championships. Fast forward to today, 84 years later, and the Red Sox find themselves zero championships richer than they were in 1920. They call it “The Curse of the Bambino”. So what happened in 1986 was apparently just another consequence of the curse. Between 1986 and 2004, the Red Sox have had other chances in the postseason. In fact, just last year, they took the Yankees to extra innings of Game 7 of the ALCS, only to be beaten by an Aaron Boone home run. Yes, Aaron Boone. Not even the good Boone. And so it was with great anticipation that I watched this year’s ALCS, which concluded about an hour ago. My former bitterness toward the Red Sox had long been replaced by sympathy and pity, so it was easy to root for them. Especially given their opponent, A-Rod and the New York Yankees… archrivals of ours in Seattle. I’ll spare the narration of the entire playoff series but let me just say it was perhaps the most incredible series in postseason history. In any sport. Ever. Boston falls behind three games to none, a hole no team has ever dug out of. The next two games go five hours apiece, with Boston winning both dramatically in extra innings. After winning Game 6, Boston jumps all over the Yankees in Game 7, winning 10-3 and advancing to the World Series. The game was a pleasure to watch, but I have to say that the normally top-notch broadcast team of Joe Buck and Tim McCarver was a bit of a disappointment. The most dramatic moment of the game came in the second inning with Johnny Damon hitting a grand slam to put the Sox up 6-0. There was no emotion from either Buck or McCarver and no mention of how this was one of the most important home runs in Red Sox history. At one point, McCarver even took the time to point out that he “wouldn’t really call this whole comeback miraculous”. The apathy of the broadcast team is interesting as well because neither has Yankee roots. If anything, they both have Cardinal roots with Joe’s dad, the legendary Jack Buck, announcing for the Cards for so many years and McCarver catching for them. Another interesting moment in the game came when Boston manager Terry Francona decided to put Pedro Martinez in the game with an 8-1 lead in the 7th. I, along with Buck, McCarver, and probably most of the world thought that was a ridiculous move given the big lead and how well Boston’s starter was pitching. That move would only be made in Boston. Boston has turned into such a paranoid franchise under The Curse that they didn’t trust any pitcher on their squad besides their ace to hold a 7 run lead against the Yankees. It was irrational, it was the wrong move, and Boston paid for it with two quick Yankee runs and a possible loss of confidence in Pedro, which may be a factor in the World Series. The other interesting thing about the game was that when Boston won, the Yankee Stadium speakers blared “New York, New York”, a song typically only played when the Yankees win. I couldn’t tell if it was out of sincerity or mockery, but the Red Sox players didn’t seem to mind. It was also great to see Yankees General Manager Brian Cashman watch the Red Sox celebrate on the field. The Fox camera cut to him staring on in envious appreciation, and that is the moment I knew he was a real baseball guy. A lot of GMs would have left for the clubhouse right away, but Cashman wanted to feel the pain for a bit. That is impressive to me. And finally, the ultimate irony of the series came when I realized the personal significance of Boston’s starting battery for Game 7. Here it was, arguably the most important game in the history of the franchise, and Boston starts pitcher Derek Lowe and catcher Jason Varitek. Where did Lowe and Varitek come from? My Seattle Mariners. For Heathcliff Slocumb. And now I must look forward to another 84 years without a championship. Congratulations Boston on a great victory. 36 comments on “The Curse is (Almost) Lifted”. Leave your own? I nurse a healthy hatred toward the Yankees (as do many) because of their 4-0 routing of the Padres in the 1998 World Series. And while I can’t even come close to saying I can empathise with 84 years of painful twists of fate, the irony of Tony Gwynn’s legendary career ending against a backdrop of losses was heartbreaking to say the least. Watching Boston win this unprecedented series has rejuvenated my love for The Game and satisfied a long-standing desire for the Yankees to finally get a hearty taste of the bitter end. I’ve always been under the impression that everybody hates the Yankees except for New Yorkers and dumb sportscasters. It’s so boring to see them keep winning. Tiresome. The Yankees won again. Who cares. I’m looking forward to seeing the Sox play my Cardinals, and I won’t mind it that much if they win. Which they won’t, but whatever. I hate the Yankees because the hold an unfair advantage over every other team in baseball. Sure it doesn’t always win them the series, but it keeps them 1 of 4 AL teams in the playoffs just about every year. Anyway, when I saw the upset Yankee fan’s I wanted to laugh in their faces, taunt the hell out of them and generally rejoice in their suffereing. What do they know about losing? How dare they be upset? Try living in Seattle where we can’t keep players to save out lives, especially in the unfair playing field that is baseball. Oh and don’t get me started on A-Rod. I love seeing that jackass lose. If he never gets farther than that I’ll be a happy baseball fan even if my M’s stay in the toilet. On a positive note, I’m pulling for the Cards in the NL. For some reason I just like that team. 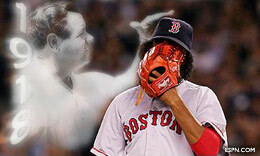 Cards/Sox would be a great series and you know I’m hoping the curse will be lifted. Go Sox. I have to agree with Keith about seeing A-Rod lose. Every loss for Texas and now the Yankees is even sweeter. This was an amazing series. Since I am a Mariners fan from birth (They were formed in ’77 and I was born in ’78), I have to add that this was the best Yankee loss since the M’s beat them in the playoffs in ’95. Oh those were the days. As for the significance of the series, very well said Mike. Boston did deserve for this to be called the best postseason series ever, even if Minnesota/Atlanta (baseball) and a few others (NY fans?) might argue. And for you to recognize Varitek is a very cool thing, but besides being from Seattle’s system, his 10-pitch at-bat two nights ago that resulted in a single vs. Lieber was a thing of beauty and set up their 4-run inning. And that’s the best part of this Boston team — Ortiz may have been the MVP, but each player seemingly made a difference in this series. I can’t close this w/o also repeating your commentator notes. As a former director/producer, I too was blown away by the apathetic attitude of the Buck/McCarver combo. Leiter was at least enthusiastic, if not very well spoken. Buck is better than that. 2004-1918 = 86 years. Not 84. As a lifelong Twins fan, seeing Dougie “Defense” Mientkiewicz and David “Papi” Ortiz helping the Sox win wasn’t painful at all. In fact, seeing these two ex-Twins take down the Evil Empire was refreshing and enjoyable. Yes, it is frustrating to know that “we could still have those guys,” but the economics of baseball for my small-market team are, unfortunately, going to mean that some great players go other places and win more than the home-town team. (I’ll not rant about Chuck “I forgot how to throw to first” Knoblauch forcing his trade to NY…) The whole situation is unfortunate, but MAN is it ever fun to watch the Yankees not only lose, but do so in the most humiliating, unprecedented way possible. I was extremely frustrated that the Twins were unable to beat the Yankees in the ALDS, but the Red Sox more than made up for it with that show. Finally, just a quick point of interest: The Yankees play “New York, New York” after every game. If they lose, it is the Sinatra version. If they win, it is Minnelli’s. For those of us who are Yankee-haters, the sweet sound of Sinatra is even sweeter after a game. Right, 1918 was the last championship, but Ruth got traded in 1920, which is 84 years ago. And as for A-Rod, oh yes, that’s another story altogether. Did anyone see the anger and disappointment on his face in the dugout as the Red Sox celebrated? A thing of beauty. Especially given their opponent, A-Rod and the New York Yankees… archrivals of ours in Seattle. Long story short, the Yankees are just one of those teams that you always want to beat more than anyone else…and Boston just did so in the most inconceivable manner possible. I know the World Series can’t possibly match this series in excitement — can’t it? — but I will be watching each game to see if Boston can finally win a championship with its beloved Sox. Seeing the disappointment on A-Rod’s face was wonderful — and this series proved to me that he doesn’t have the class that other Yankees players have. The way he waved off the amazing diving catch from Trot Nixon at Fenway, and of course the now infamous karate chop in the first base line. As a Boston radio commentator said “you wouldn’t see Derek Jeter doing that”. I’m now thankful we didn’t get A-Rod afterall. Yeah, A.Rod has lost alot of credibity with me since he has played for the Yankees. I no longer think that he is worth anywhere close to what he is getting paid. Superstars dont need to cheat to win. And what the hell is up with those purple lips of his? Can anyone help me out with this. Being curious about the word ‘sox’ vs. ‘socks’, I decided to open up my trusty rusty Wikipedia and do a little research. Turns out, the initial team names used the word ‘stockings’, later shortened to ‘socks’. So apparently ‘sox’ is just a language relic that’s stuck around. Figured perhaps someone might find that interesting. Cheers! Dan, Curt Schilling also said to Dan Patrick on ESPN radio that Jeter would never do that. It’s one thing to hear it from a homer Boston announcer, but from Schilling it takes on a whole new life in my opinion. I honestly don’t think the chop was that big of a deal (considering the speed of the play and the heat of the game), but I certainly am glad to see A-Rod take an earful and still have to wait at least another year for that ring…. By the way, the only thing missing from last night was Pedro busting a moonwalk across the NY logo behind home plate and then dropping right into a backspin – besides that it was perfect. Speaking as an outsider with a relatively take it -or- leave it kind of approach to baseball, this series is surely accountable for a few hours of lost productivity at work as I anxiously watched the espn.com live scoring update every few seconds. I can’t claim to know too much about baseball players, but I have always been a fan of american sports (Basketball primarily) especially the stats – as I love numbers and statistics. I must say, I was surely rooting for the Red Sox. Not so much because I have anything against the Yankee’s, but who doesn’t like to see triumph over advesity? Absolute euphoria – That is the only way this life long Red Sox fan can begin to explain the mood in New England right now. It is nearly impossible to put into words just how important the Red Sox are to so many people. They represent loyalty and hope, and a bond among generations of believers. Mike, from the opposite side of your story – In 1986 I was merely 5 years old and that bouncing ball through Buckner’s legs is my first Red Sox memory. Apparently, according to my father who had brought me out to the TV to witness the “history” that was about to take place, I looked up at him and simply asked “Why didn’t he stop the ball?” I have been a Red Sox fan ever since. Hearing a story from the other side of the diamond was really enlightening. It’s amazing how much baseball can become such an important part of our lives. This past week I have done nothing but go to work and watch baseball. Sleep has been minimal, food has been optional – this past week the Red Sox were all that mattered. It just means that much, it really does. I truly appreciate reading comments from all over the country from people who said they were pulling for the Sox in this series. There’s a great bumper sticker in New England which reads: “I root for two teams: the Red Sox, and whoever is playing the Yankees” – I’ve gotten the general feeling that may be ubiquitous outside of New York, and that thrills me. In reference to Tim MCCarver — he is the worst! He actually had a short stint with the Red Sox as a player — but was the Yankees Analyst for 3 years up to 2002. He is a massive homer. Jeter can do no wrong. He can’t even get the Sox players names right. One night he said Pedro would pitch againt Brandon Arrojo. Joe Buck gave him a moment to figure it out before he said its Bronson and he plays for the Res Sox too. As for 1986 I don’t blame Buckner for that loss, blame the pitching, I believe they had 2 outs and had 2 strikes on four batters and allowed hit after hit — the also included a wild pitch. Buckner just happened to allow the final run. As a baseball fan living in Canada, I have adopted the Blue Jays as the team I call my favourite. I will be cheering for the Cardinals in the World Series for two reasons (see a player like Larry Walker who hasn’t seen much postseason action finally win and to see the curse live on). Growing up a Jays fan it was very easy to root against the AL East opponents (back then it was Tigers, Orioles, NY, and the Sox). For whatever it’s worth, they play the Sinatra version of “New York New York” after a Yankees win, and the original Liza Manelli version (from the 1977 ‘New York, New York’ film directed by Scorsese) when the Yankees lose. Because of this fact, I now have vastly different emotional reactions to hearing either version of the song. My favorite moment was when the camera cut away to a Yankees batboy crying. And that was around the 3rd inning. What a beautiful game of baseball. @Marc Broad – kia ora! Fun to see a Kiwi is keeping up on American baseball. Had to live in Auckland for a bit, but much more enjoyed the time living down on the ‘mainland’ ;-) Go the All Blacks! I’ve been out of the baseball arena for several years, not making it to the local minor league games for a long time. It’s stuff like this that draws you back. I was excited to follow the games. Now if only I can make time to watch the World Series on the tv. Where are you at these days? Not NZ by the sounds of it. I don’t know why i never got right into baseball. I suspect it has to do with the fact that it isn’t played in New Zealand, whereas basketball is. Long weekend here (due to my wellington lions losing the grand final of the npc rugby), and while nursing a rather painful hangover managed to catch the opening game of the world series. I may just be turning into a baseball convert… Bloody good game. Just enough of everything to keep it exciting. Maybe not a classic in the true sense of the word, but sets the tone for the rest of the series. Four errors. Nine runs allowed. Two hefty leads blown. Three straight walks in an inning. And they won? Go the sox! @Marc, living in on the North West coast of America… for now. Next year is Europe and then hopefully and finally back to the beautiful land of Aoteroa. Can’t wait to set foot on that soil again! Game #2, check! Go Gimpy the Pitcher! Who’s Your Daddy up next! to reply to both you and ~bc, when people refer to the Curse, they refer to the number of years the championship was last won, which in this case is 1918. You are correct, Ruth was traded, rather sold, to support a local theatre company, in 1920. However, the last championship won, was 1918, and the reference to that remains 1918. Note: I live in Boston, and have been most of my life. I hear about it all the time. I especially hear about from most of my friends who live in the NYC area. *sigh…. Credit should be given where credit is due — I hate the economic reality that results in the Yankees having so much more money than, say, the team I (used to) root for, the Expos, but as the Mets (and countless other teams have shown over the years), having money is no guarantee of success. The roster can still only have 25 players, so your player selection still has to be done wisely, and Cashman has done well. (I fully agree he has a lot more cushion to make mistakes than most teams.) Another team that deserves acknowledgement is the Braves, who I hated for making the NL East a difficult place for anyone else to win a division title, but have pulled off an incredible feat with their unbroken pennant streak (excluding 1994), while going from a big market team to a, well, not small market, but a team whose revenue streams are more ordinary. I don’t pity Yankee fans (try having your one good shot at winning the World Series taken away from you by a player’s strike, and having this missed opportunity contributing to the death of your team), but I can sympathize. It’s never easy to watch your team lose (and in the spectacular way the Yankees did). I don’t get the vehemence against Rodriguez. The problem posed by his large contract was a self-inflicted wound by the Texas ownership. (And he was, after all, the 2003 MVP.) It was not too long ago that Pedro took down a 72-year old man, an incident far more ugly than the slap given by Rodriguez. I think Pedro’s a great pitcher, and I loved the way he remembered the Expos coaches after being traded to Boston (right after winning his first Cy Young), by giving them Rolex watches. But he can be a bit of a hothead — after hitting a few people with pitches, it took him years with the Expos before he got the benefit of the doubt on anything close. My only real disgust for A-Rod revolves around one particular part of his contract. Yes, it is Texas’ fault for offering the contract, and yes, A-Rod was well within his rights and his brains to accept it, but the part of it that I just despise is the “escalator clause”. An escalator clause basically says that for the life of the contract (10 years), A-Rod is guaranteed to be the highest paid player in the game. Meaning, let’s say some kid comes up to the big leagues next year and hits 70 home runs and bats .400 for three straight years. He’s obviously a huge talent so he gets a contract worth 15 or 20 million a year. A-Rod, though his numbers aren’t as good, automatically gets his contract raised above that level. To be so cocky as to insist that you will be the best player in the game for the next 10 years is just too much for me. A side note: the clause in Rodriguez’s contract only takes effect in the last two years of the contract. in germany baseball becomes always popularly I also here thinks is connected with which eat german always the something for good did. I am looking to buy a shirt that says “My two favorite teams are the Red Sox and whoever is playing the Yankees” or something like that. Anyone know where I can buy it? I am looking to buy a shirt that says “My two favorite teams are the Red Sox and whoever is playing the Yankees”. Does anyone know where I can buy one? The one constant is baseball. I’m trying to buy the same shirt as Anne Grasmick….see above. Do you know where I can get this shirt?